With the recent polemics surrounding a certain image that won a photography competition recently, I feel like we need to talk about travel photography. About people photography, in our case. And to set up boundaries as to what’s acceptable in both cases. Honestly, in my opinion, it’s a matter of common sense – but it seems that’s not enough. 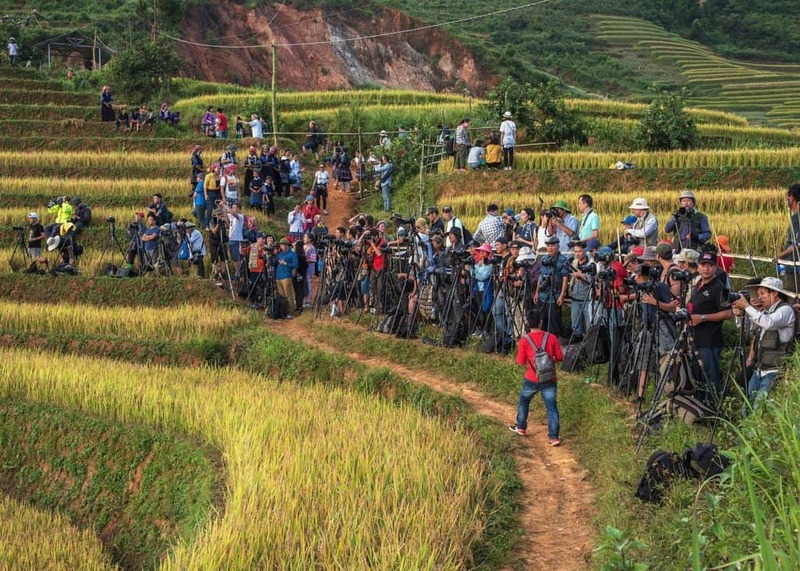 We still witness some shocking scenes in the world of travel photography these days. 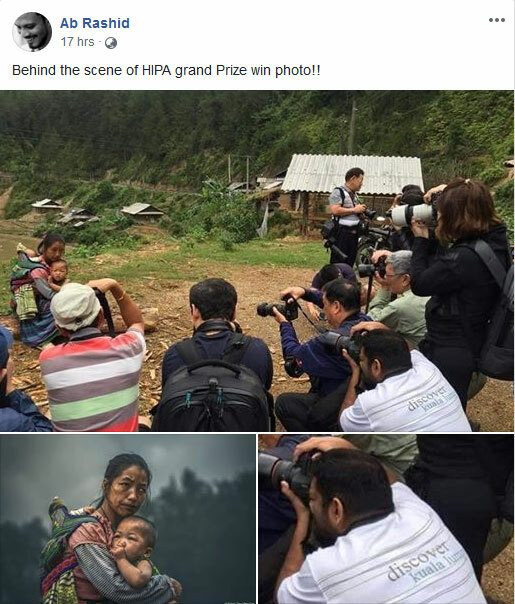 A ‘staged photo’ by Malaysian photographer, Edwin Ong Wee Kee, won $170,000 – a decision that caused quite the stir. Source: Facebook/Ab Rashid. Let’s start by looking at photography in a wider context. When it was first invented, staged images were pretty much the only option. The equipment was big and bulky (and expensive) and the exposure times were very long. Anyone who wanted to photograph people had to have them stand still for several minutes. Even with the invention of the collodion technique in 1851, the exposure time still had to be 2–3 minutes. Not exactly spur-of-the-moment stuff. Just waiting for that perfect light! Photo courtesy of Mike Pollock. Source: Pics of Asia. Now, about the staging thing. A lot of photographers travel around the world and stage images wherever they go. And there’s nothing wrong with staging photos. They can help you to take better pictures, and guarantee that you return home with ‘the shot’. I know a lot of great photographers who stage images as part of a project they’re working on. But none of them lie about it. Staging your images closes the doors to all of these factors – factors which can make creativity happen. Of course, it isn’t as simple as that. Becoming a good photographer, who is able to capture a good image in any condition, takes years of practice. But there are no shortcuts when it comes to art, and the real genuine art takes years to create. Take the example of fashion photography. Most of the time, the final image starts with a concept, an idea. What differentiates it from travel photography, is that the people coming up with these ideas are usually good at doing so. They’re artists, they make bold moves, they think creatively to catch the attention of the public. Frankly, as a photographer, a teacher and a fan of creativity, I find it pathetic to be constantly exposed to the same images – merely copies of copies of photos that, once upon a time, were original and authentic. Think about it. If you know how to build a website, that’s all you need. You can launch your new ‘Renowned International Photography Competition’ website, and charge people to enter their images. Then you can find tonnes of emerging photographers happy to judge the images for exposure. You make money, you don’t spend any. Jackpot! The truth is, there is no exposure for the judges. When is the last time you checked the bio and website of all the judges in a competition? Since it’s getting more and more difficult to make a name for yourself in the world of travel photography today (remember, everyone is a photographer), then it seems that winning photography competitions could help. What that means is that photography competitions officially decide and inform the public what a good picture is. And that’s the scary part! If you see an image winning the National Geographic photography competition, you’ll probably think that it must be a great image. Similarly, people seeing competition-winning images tell themselves that these must be great images, the images that they should be taking in order to… win photography competitions. They’re leading by example: what to shoot in order to be popular. The sad thing is, it’s becoming more and more rare to see real creative work being awarded. People want the ‘wow’, the postcard. The problem is, the postcard isn’t real. It was created to look ‘wow’. Why are you practising photography? If your goal is to become famous and win competitions by staging beautiful images, there is ethically nothing wrong with that – if you are clear about what you do and how you do it. The worst thing is finding out that a photographer lied about staging images. It usually means, for them, the end of a promising career. – Etienne Bossot, founder of photo tour company Pics of Asia, is a teacher and tour guide. This article originally appeared here. Great Article. Thank you. Would love to start a discussion on this. I’m an advertising photographer and also shoot a lot of personal work. Most of our work commercial work is constructed (stage). A lot of our personal work is as well – it’s not travel photography, it’s creative ideas that we execute it. What’s funny is our style is candid, although we stage it. Travel photograph is difference I supposed, becuase the EXPECTATION is that it’s not staged and is real life. So the creative part of travel photography would purely be how you used your camera and how you observe the world – finding beautiful light, nice/different angles, compelling scenes, and a way to communicate a message powerfully without interfering with the environment. So you are creating an image via HOW you capture it, rather than (what happens in advertising) how you construct AND capture it. I’d find it an interesting challenge to capture travel imagery in a creative way that is unique. Maybe i should take the challenge – i might see something others don’t becuase I’m trained differently. Yes, Andre, the pleasures of travel photography is that we have no idea what we are going to get at the end of the day. It is a great exercise as we are constantly thinking about composition, and anticipating our subjects’ actions (in Asia we mostly focus on people photography).